An estimated € 23 million were put into the complete rebuilding and expansion of the Parkhotel Schonbrunn in Vienna. Currently, the builders put the finishing touches. Pretty decent furniture, a crumbling facade, a cheap snack bar on the corner - from the imperial flair was felt in the Parkhotel Schonbrunn in Viennas finest district Hietzing end up not much more. Approximately one and a half years later, after an estimated € 23 million investment, it looks at the still-building site is different: The facade has been restored to yellow in bright, indoors drag builders carpets along the corridors, the first crystal chandeliers hang back in place and parquet flooring be brought to a shine. "We went into the substance. From the old house during the renovation work was not much left," says Wilhelm Hübner during an exclusive tour of the site. Together with his cousin Ingeborg he is the owner of the hotel, which was leased to Austria Trend Hotels & Resorts. 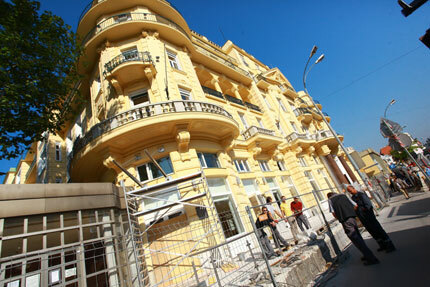 During the renovation work, where all the lines replaced and air conditioning were installed, the four-star hotel was closed - on 10 November, expects its first guests. A "byproduct" of the conversion work: There was a 300-square-foot, dividable conference room overlooking grown in the garden. Before the conversion at this point are the suppliers and extended. Also, the reception has been given a new, representative seat in the house. Who pays his bill here in the future, simultaneously a (free) take a view of the Schonbrunn Palace. Just off the reception room for a chic lobby bar and fireplace has been created that will attract not only hotel guests but also Hietzinger. In retrospect, says Huebner, the partially conducted up to 200 construction workers on site: "There were a thousand details to solve problems, but in the end everything went smoothly, the building was excellent.." While the house has got a classic modern face-lift, the old, red-plush ballroom has remained largely unaffected by the renovation work. Only a new floor and air conditioning were installed. "The big challenge was to the hotel around it to make consistent with the ballroom," says Huebner. New furniture and bathroom have also got the 314 rooms, which means five-star level and now have a price. The standard deluxe Room there are from 280 € without breakfast. Who wants to reside in a junior suite € 450 must be paid, one night in the suite, there are from 750 €.